He was talking about the LeenOps Lifecycle Platform,™ a comprehensive approach that bridges the board room and the boiler room. It connects the concerns of the CFO with those of facility management, engineering and design teams. 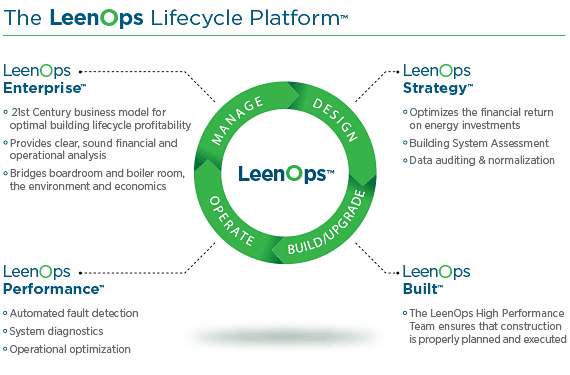 LeenOps Strategy,™ the only engineering-based decision support system able to determine the precise combination that will optimally balance economics and energy performance to improve building profitability and increase value. It delivers complete investment decision support from both an economic and an energy efficiency/engineering perspective based on the individual characteristics of each building. This is an order of magnitude beyond contemporary advisory techniques that rely only on past energy bills and/or comparison with “like buildings” average profiles. LeenOps Strategy is built on ECON’s LeenOps Building Investment Optimizer™ (LeenOps BIO™), a groundbreaking, sophisticated energy analysis tool that uses deep financial and engineering analytics to determine the investment that produces the optimum combination of economic return and energy performance. LeenOps BIO is built on the industry-standard EnergyPlus energy modeling program used by architects, engineers, contractors and energy consultants around the world, enhanced to accelerate on-boarding, optimize analysis, and deliver extremely detailed decision support. LeenOps Built,™ elite teams of returning military and industry veterans with extensive experience in operations, planning and execution available to either manage or execute the project, as well as install market-leading technology accessible to ECON through our deep industry contacts. LeenOps Performance,™ a continuous diagnostics and commissioning process that feeds back into your building’s operational management systems and the LeenOps BIO model developed for your specific building. It provides an objective measure against which actual building performance can be evaluated and optimized at will over the building lifecycle. Services include automatic notifications, network monitoring, and field LeenTeams available for deployment back into buildings whose operators need additional assistance. LeenOps Performance offerings include next-generation, low-cost sensors that generate consistently accurate real-time data to enable more cost-effective and efficient deployment of maintenance resources, as well as a better understanding of the building’s performance profile. LeenOps Enterprise,™ the 21st Century business model for economically and environmentally optimized commercial real estate management that establishes an optimal lifecycle plan for commercial buildings, supported by clear, sound financial and operational analysis and execution. Share the post "The Nuts and Bolts"